Top Ten Tuesday is a feature run by BrokeAndBookish each week. This week the topic is all about the books we want our future hypothetical kids to read – or if we have any young children in our lives like nieces and nephews, what books we’d love them to read. I don’t know if I’ll have children, but there are definitely some books that I feel young kids should read, and books that shaped me and I’d love to share. This series was one of the first to make me cry and I was less than ten years old. I’m not saying I want to make my hypothetical children cry but I’d like to see if it affects them as much as it did me. This whole series is magical but The Lion, the Witch and the Wardrobe is the most magical and I think it’s one of the most accessible for younger readers. Top Ten Tuesday is a feature run by BrokeAndBookish each week. As 2016 is coming to a close, this week’s theme is all about our favourite books of the year. I didn’t really get much reading done in the last few months of the year, I started a new job and couldn’t really get into any of the books I was picking up but I did read some good books in 2016. 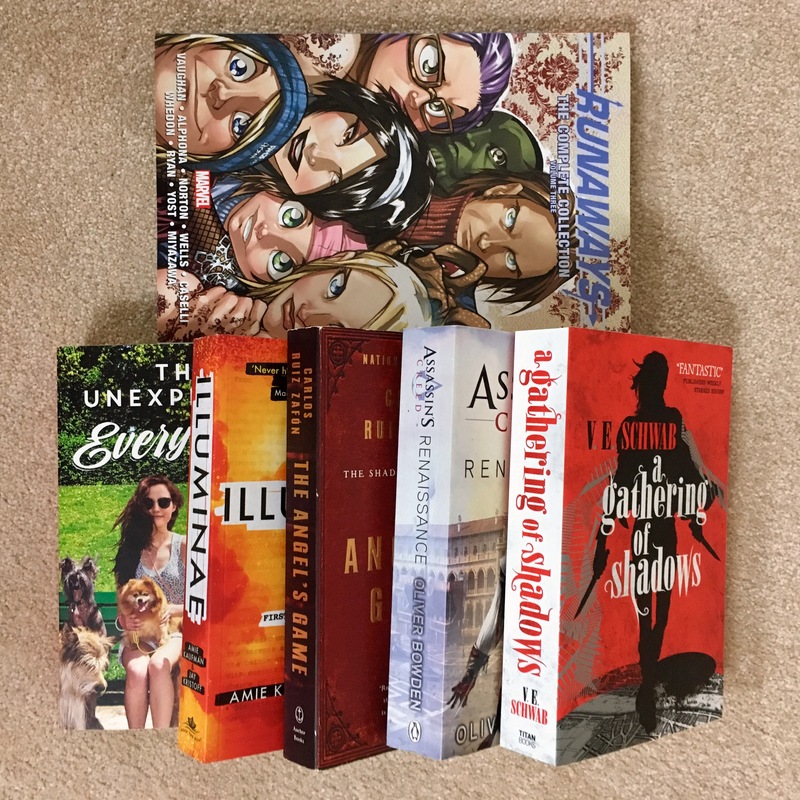 So below, in no particular order, are my ten favourite books I read this year – the links in the book titles go to their reviews where you can find out more about why I liked them so much. This book was unlike anything I’d read before. It’s the perfect commentary on the fantasy genre and it’s a very funny read as well. This was one of the first books I read this year and it stuck with me a long time after I finished it. It’s the year 2375 and two mega-corporations are at war over a small, insignificant mining planet. Pity they didn’t warn the people living there. With enemy fire raining down, Ezra and Kady manage to make their escape on the evacuating fleet. But that’s just the beginning of their troubles. A deadly plague has broken out on one of the space ships, their ships protection is vulnerable and no one will say what is going on. As Kady hacks into the ships mainframe to try and find the truth it soon become clear that Ezra is the only one who can help her. The only problem is that they split up before the war started and she isn’t supposed to be talking to him. Illuminae is very different from any book I’ve read before and that’s because of how it is written. It’s composed of instant message chats, surveillance footage summaries, interview transcripts, mission reports and more. Files look like they have been clipped into the book or have been printed off and stuck in. It’s really interesting and makes the book quick to read and adds a new spin on things. It’s interesting how Kady, Ezra and other characters come across through what’s kind of like second-hand text. Kady is super smart and feisty and wants to know the truth about what’s going because both the good and the bad will affect her and her loved ones. Kady is also stubborn and believes she’s always right which does rub people, including Ezra. Ezra is almost the polar opposite of Kady and it’s difficult to imagine them as a couple (though opposites attract and all that I suppose), he follows the rules and doesn’t really question anything, especially when he’s conscripted into the military. Illuminae is a super-fast read. That’s down to how it’s written, reading conversations through instant messages will always take less time than “proper prose” but also because it’s an action-packed book. It kicks off with a war and then there’s corporate espionage, military cover-ups and a deadly plague. It’s one thing after another that Kady and Ezra must work together to deal with and how they cope will test them and offer both funny and tense moments. 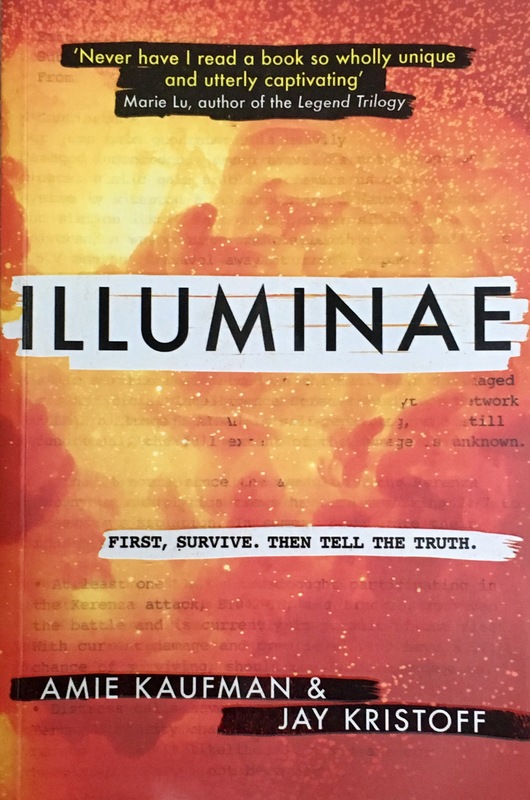 Illuminae is an exciting sci-fi book that has a lot of surprises and I can’t wait to read the sequel. 5/5. This readathon is created and co-hosted by ThoughtsonTomes from November 18th till December 1st and the aim of it is to read those huge intimidating books that are over 500 pages long that have been sitting on your shelves for ages. There’s a few challenges you can try and complete which are below but really the main thing is to read some long books. I took part in the (I believe) first Tome Topple Readathon in June and it gave me the push to finally read American Gods by Neil Gaiman. Since then I haven’t really read any more of my big books so this is another chance to read another of my 500+ page books that have been on my shelves for ages. I like having some choice when it comes readathon’s so here’s the books I’ll maybe be reading in the latter half of this month. There’s two books that I’d really like to read during Tome Topple and those are A Gathering of Shadows by V.E. Schwab which has 511 pages and is an adult novel that’s also a part of a series and Illuminae by Amie Kaufman and Jay Kristoff which has 599 pages and would also fit the part of a series challenge. Naturally if I read both of them I’ll have completed the read more than one tome challenge. I didn’t think I had a graphic novel that’s over 500 pages but turns out Runaways: The Complete Collection Volume 3 by Brian K. Vaughan and others has 528 pages (according to Amazon) so that is definitely on my TBR and will help break up all the many pages I hope to read. As I’m prone to changing my mind when it comes to readathons I’ll also have a couple of other tomes on standby in case I can’t get into Illuminae or A Gathering of Shadows for whatever reason. Those books are The Angel’s Game by Carlos Ruiz Zafon which has 531 pages, and fits the adult novel challenge and the tome that’s a part of a series challenge, Assassin’s Creed: Renaissance by Oliver Bowden which has 516 pages, fits the part of a series challenge and I think it’s considered an adult novel, and The Unexpected Everything by Morgan Matson which has 517 pages, it doesn’t fit any challenge but it has been sitting on my shelves for almost six months and seems like a fun, easy read. I haven’t said anything about buddy reading yet that’s because while I don’t know anyone who is taking part in #TomeTopple and who are reading the books on my TBR, there’s a Goodreads group where you can discuss popular books so I’ll be checking that out over the weekend to see if anyone else is going to be reading some of my tomes. Theoretically I should be able to complete all the challenges but like with the first Tome Topple Readathon I’ll be happy if I read one big book. I’ll probably be tweeting about my progress @ElenaM52 and you can find out more about the readathon and all the co-hosts here. Good luck to all those who are taking part!